Linkages Update is our means of keeping you informed of what’s new on IISD Reporting Services' Linkages website. This page is updated on a fortnightly basis, while the website continually posts new information provided by our contributing writers. If you wish to submit relevant materials or subscribe to Linkages Update, e-mail prisna@iisd.org. You can now search for ENB’s coverage of international meetings on http://news.google.com/. Thanks to the support of the French government, ENB now provides French versions of all its reports and online coverage of meetings. French versions of the bulletin and webpages are accessible through the English webpages. Images from IISD Reporting Services’ digital coverage of meetings are freely available, with proper citation. If you are looking for an image of a particular person or event, use our search site. Jong-Wook Lee began his term as the new chief of the World Health Organization (WHO) on 21 July. Succeeding Gro Harlem Brundtland, Lee has pledged to focus the WHO on achieving results in countries, helping to tackle the human resources crisis in the health sector, and prioritizing HIV/AIDS. More. Nitin Desai, Under-Secretary-General for Economic and Social Affairs, has been appointed by UN Secretary-General Kofi Annan, as Annan’s Special Adviser for the World Summit on the Information Society (WSIS). The WSIS, which aims to bridge the digital divide between rich and poor, is the first UN summit to address issues arising from the information society. 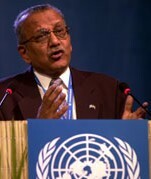 Desai was the Secretary-General of the World Summit on Sustainable Development held in Johannesburg last year. More. Richard Meganck was installed as the first Director of the UNESCO-IHE Institute for Water Education, leaving his former post as Director of Sustainable Development and Environment at the Organization of American States. Meganck undertook his first public function with UNESCO-IHE on 17 July in an address at the UNESCO-IHE Symposium on Water Education and Capacity Building. More. Click here for access to complete listing of upcoming meetings. Limnology and waterbirds conference 2003: 4-9 August 2003. Sackville, New Brunswick, Canada. International conference on advances in water supply management: 15-17 September 2003. London, UK. First international coral reef ecotoxicology and health workshop: 21-27 September 2003. Bermuda. Conference on the efficient use of biomass for GHG mitigation: 30 September - 1 October 2003. Östersund, Sweden. International conference and OECD workshop on biological resources and migration: 5-8 October 2003. Marburg, Germany. Medcoast 2003: 7-11 October 2003. Ravenna, Italy. International conference: green power 4 sustainable energy development for improved quality of life: 16-17 October 2003. New Delhi, India. Workshop on accessing biodiversity and sharing the benefits: 29-31 October 2003. Davis, California, US. First Southeast Asia water forum: 17-21 November 2003. Chiang Mai, Thailand. CSD acting as the Prepcom for the international meeting to review implementation of the Barbados programme of action for the sustainable development of SIDS (Barbados +10): 14-16 April 2004. New York, US. 29th international technical conference on coal utilization & fuel systems: 18-22 April 2004. Clearwater, Florida, US. 12th session of the CSD: 19-30 April 2004. New York, US. Third international symposium on sustainable management of forest resources (SIMFOR 2004): 21-23 April 2004. Pinar del Rio, Cuba. 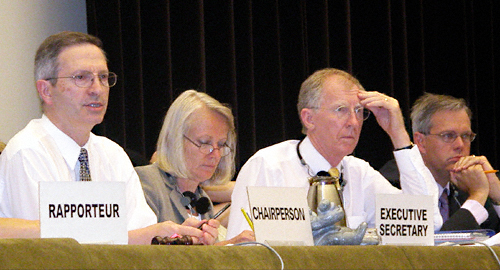 Sixth international symposium on legal aspects of european forest sustainable development: 1 June 2004. Brasov, Romania. 10th international coral reef symposium (ICRS): 28 June - 2 July 2004. Okinawa, Japan. Meeting on forests under changing climate, enhanced UV and air pollution: 27-31 August 2004. Oulu, Finland. Conference on regenerating mountain forests – prerequisite for sustainable management: 12-16 September 2004. Kloster Seeon, Bavaria, Germany. Monitoring science and technology symposium: unifying knowledge for sustainability in the western hemisphere: 20-24 September 2004. Denver, Colorado, US. First international ecoagriculture conference and practitioners’ fair: 27 September - 1 October 2004. Nairobi, Kenya. CSD policy year preparatory meeting: 28 February - 4 March 2005. New York, US. Seventh international symposium on legal aspects of European forest sustainable development: 1 April 2005. Serbia and Montenegro. 13th session of the CSD: 2-13 May 2005. New York, US. The Seventh Session of the Intergovernmental Negotiating Committee (INC-7) for an International Legally Binding Instrument for Implementing International Action on Certain Persistent Organic Pollutants (POPs) was held from 14-18 July 2003, in Geneva, Switzerland. With expectations that the Stockholm Convention will enter into force early in 2004, this was almost certainly the last meeting as an Intergovernmental Negotiating Committee. Significant progress was made during this meeting in laying the groundwork for the successful administration of the Convention, although a number of the most contentious issues have been left for consideration by the Conference of the Parties (COP). During the week, delegates focused on addressing a number of “housekeeping” issues in preparation for the first COP. These included developing rules of procedure and financial rules for the COP, clarifying dispute settlement rules, elaborating reporting formats, and considering offers to host the permanent secretariat. INC-7 also provided the opportunity for delegates to consider some of the more complex and contentious issues that will need to be addressed as the Stockholm Convention enters into force. These include such issues as the financial mechanism, the terms of reference for the POPs Review Committee, and non-compliance. No progress was made on the issue of a non-compliance mechanism, with developing countries firmly entrenched in their position that technical and financial matters be addressed prior to non-compliance. Discussions on this issue were postponed. Click here for the Earth Negotiations Bulletin report on this meeting. Two UNFCCC workshops on synergies and cooperation with other conventions were held from 2-4 July 2003 in Espoo, Finland. The Subsidiary Body for Implementation (SBI) workshop was convened in response to a request made to the SBI by the seventh session of the COP, held in November 2001. The Subsidiary Body for Scientific and Technological Advice (SBSTA) workshop was convened in response to a request made to the UNFCCC Secretariat by SBSTA-17, held in October-November 2002. The SBI workshop focused on possible synergies and joint action with other multilateral environmental agreements, while the SBSTA workshop addressed cooperation with other conventions. Click here for the Earth Negotiations Bulletin report on this meeting. With the theme of “Implementation of NEPAD as a contribution to Africa’s Development,” this year’s African Union Summit comprised meetings of the Assembly, the Executive Council and the Permanent Representatives Committee. The Assembly adopted five Declarations on matters such as the upcoming fifth WTO Ministerial Conference, HIV/AIDS, Tuberculosis and Malaria, agriculture and food security, and NEPAD implementation. The Assembly also took over 20 decisions on topics relating to, inter alia, human rights, poverty alleviation, democracy and good governance, and terrorism. Decisions were also taken on a number of environment related topics such as the Action Pan of NEPAD's Environment Initiative, and the revised 1968 African Convention on the Conservation of Nature and Natural Resources (Algiers Convention). The Assembly further adopted the draft Protocol to the African Charter on Human and Peoples' Rights relating to the Rights of Women, which would, among other things, prohibit female genital mutilation, grant women the right to vote, set the minimum age for marriage at 18 and guarantee women the right to inherit and own property. More information. Two meetings at the ministerial level convened recently to prepare for the sixth session of the Conference of the Parties to the UN Convention to Combat Desertification (UNCCD). The African Ministerial Conference convened in Cotonou, Benin, from 3-4 July 2003, while the Second Asian Ministerial Conference on UNCCD Implementation convened from 10-11 June 2003 in Abu Dhabi, United Arab Emirates. Participants at both meetings discussed the outcomes of the World Summit on Sustainable Development and the first meeting of the UNCCD’s Committee for the Review of the Implementation of the Convention, progress on implementing their respective Regional Action Plans, and financing of implementation, especially in reference to the Global Environment Facility (GEF) Operational Programme for land degradation. Each Conference adopted a Ministerial Declaration, both of which, inter alia, called on UNCCD Parties to adopt at COP-6 a decision for the GEF to become a “funding” or “financial” mechanism of the UNCCD. More information. Over 750 participants from governments, the private sector, intergovernmental organizations, civil society and the media attended the intersessional meeting of the World Summit on the Information Society (WSIS). Hosted by UNESCO, the meeting completed revisions to the draft Declaration of Principles and the draft Plan of Action that are to be adopted at the WSIS meeting in Geneva in December this year. The draft Plan of Action contains a list of over 120 examples of potential actions to promote information and communications technologies (ICT) development, for example connecting all villages by 2010, having 90 percent of the world’s population to be within wireless coverage by 2010, and launching a “Global Digital Compact.” The draft Declaration of Principles supports an information society that is accessible to and that serves everyone. More information. Delegates at this session of the Codex Alimentarius Commission adopted over 50 new food safety and quality standards, including agreement on assessing the risks to consumers from foods derived from biotechnology, including genetically modified foods and irradiated products. The guidelines cover the scientific assessment of DNA-modified plants, such as maize, soy or potatoes, and foods and beverages derived from DNA-modified micro-organisms, including cheese, yogurt and beer. New quality standards adopted by the session include the specification that products marketed as “chocolate” must have a minimum of 35% cocoa solids, while “chocolate type” products must have a minimum of 20%. More information. The 26th meeting of the Standing Committee of the Convention on Migratory Species (CMS) addressed: collaboration with other international organizations; implementation of CMS Agreements and MOUs; development of further agreements; and development of strategic plans for the work of the Scientific Council and for the future implementation and development of the Convention. The Committee also reviewed the current status of the Trust Fund contributions, the budget and resources, and decided on work priorities of the Secretariat. More information. Water management was one of the key issue areas discussed at the World Economic Forum’s Extraordinary Annual meeting. During a session on 23 June 2003, panelists discussed a wide range of water issues, including political barriers and opportunities for cooperation, water as a lever of social and economic development, the role of public-private partnerships, public health, integrated water management, and desalination. More information. This meeting, organized by UNESCO’s World Water Assessment Programme, the International Atomic Energy Agency and the International Association of Hydrologists, discussed ways and means to better develop international groundwater indicators. The expert group identified nine indicators to be developed, including two recommendations that highlighted groundwater as an intrinsic part of the hydrological cycle and proposed that groundwater should be integrated within a broader economic and social dimension. More information. In its last meeting prior to the Fifth WTO Ministerial Conference to be held in Cancún, Mexico in September, the Committee on Environment (CTE) considered an EU proposal on MEA observer status as well as two US papers on environmental goods. More information. At its annual meeting in Geneva, the United Nations Economic and Social Council (ECOSOC) adopted a resolution recommending that the UN General Assembly designate the World Tourism Organization as a specialized agency of the UN. More. During the ECOSOC annual meeting, ministers issued a declaration urging rich countries to reduce and eliminate agricultural subsidies to ease market access for products from developing countries. The declaration also highlights the need for the implementation of the Doha Ministerial Declaration and the urgent need for the WTO to address agricultural export subsidies, domestic support and enhanced market access, as well as special and differential treatment for developing countries. More. The International Labour Organization (ILO) has launched an initiative to stimulate the creation of a billion jobs for youth worldwide over the next decade. More. Norway and Sweden have jointly created a Poverty and Environment Fund focused on small-scale environment-related activities that promote poverty reduction. More. Five new natural sites, along with 19 new cultural sites, were inscribed on the World Heritage List at a recent session of UNESCO’s World Heritage Committee. More. On 22 July, the Council of Ministers of the EU formally adopted two new regulations on traceability and labeling of GMOs, and on GM food and feed, completing the EU’s legislation on GMOs. More. Venezuela’s Centro de Ecología and Norwegian scientist Peter Schei have been jointly awarded the 2003 Sultan Qaboos Prize. The prize, which is given out biennially, recognizes outstanding contributions to the management or preservation of the environment. More. Catherine Bertini, UN Under-Secretary-General for Management and former head of the UN World Food Programme, has been awarded the 2003 World Food Prize. More. Concluding a five-day meeting in London, the Marine Environmental Protection Committee (MEPC) of the International Maritime Organization (IMO) – the United Nations agency responsible for the safety of shipping and the prevention of marine pollution by ships – revised guidelines on environmental safety and health-related issues, including those related to double-hull oil tankers, shipbreaking, ballast water management, greenhouse gas emissions from ships and ship recycling. More. Up to 80% of the Caribbean’s coral reefs have died and the remaining are under threat, according to a recent study published in the journal Science. More. UNESCO Director-General Koïchiro Matsuura has called for a radical review and reform of water education programmes and the need for more water professionals. More. A panel of water experts speaking at the UN Association of the United States of America’s National Forum on the United Nations stressed the importance of tackling the global water crisis. More. A recent meeting of the Joint Expert Committee for Food Additives and Contaminants, an initiative of the UN and the WHO, has called for a tougher standard for levels of mercury in food. More. Data recently published by the US Environmental Protection Agency (EPA) indicates that US industries released 15 percent fewer toxic chemicals, and generated 22 percent less toxic waste, in 2001 as compared with 2000. More. A recently conducted survey by the UK Food Standards Agency survey has found that the total amount of dioxins in all food has fallen in the UK since 1997. More. A new report from Friends of the Earth and Pesticide Action Network (PAN) UK released on 21 July, criticizes the UK Government for failing to grasp a golden opportunity to find safer alternatives to chemical pesticides, leaving farmers with little alternative to the toxic products currently in use. More. (World Bank, UNDP, UNEP and World Resources Institute, July 2003) This tenth biennial report on global environmental and development issues focuses on the importance of good environmental governance by exploring how citizens, government managers and business owners can foster better environmental decisions that meet the needs of people and ecosystems with equity and balance. The report argues that greater transparency and accountability can lead to fairer and more effective management of natural resources. It calls on governments to include the public in decisions that affect ecosystems and urges integration of environmental impacts into economic decision-making. It also identifies public access to information from governments, business, and non-governmental organizations as a necessary precursor to improved environmental performance. More. (Kluwer Academic Publishers, June 2003) Beatrice Chaytor and Kevin R. Gray edited this collection of essays on environmental law and policy in Africa from experts within and outside the region. The text seeks to demonstrate how African countries are responding to their international environmental obligations contained in instruments such as the CBD, UNFCCC and the CCD. The essays are divided into three sections: multilateral environmental agreements (MEAs); natural resources sector management; and the development of law and policy instruments. More. (SustainAbility, June 2003) Seb Beloe, John Elkington, Katie Fry and Sue Newell authored this report, which details the results of a global study of the NGO landscape. In addition to identifying 21 internal and external challenges for international NGOs, the report: examines market and political changes that are driving a “paradigm shift”; describes challenges facing NGO boards; explores NGO engagement with business; and asks how successful NGOs are likely to be in bringing change to market. More. (June 2003) Authored by Qasem Alnewashi, this book looks at improving environmental education in developing countries through a case study of Jordan. The book is divided into three parts that lay the context for the topic, present a case study surveying the status of formal and informal education in Jordan, and consider the results of the case study and how to improve environmental education in developing countries. More. (International Organization for Migration, June 2003) Produced by IOM’s Migration Policy and Research Programme, this report presents the latest trends in international migration and provides insight into “the complex dynamic of a growing socio-economic, cultural and political phenomenon.” The report notes the role of globalization, trade liberalization and economic integration in encouraging labor mobility, and estimates the 2.9% of the world population are migrants, motivated mainly by economic opportunities. The report considers, inter alia: the root causes of migration; relations with migrant diasporas; integration of migrants in host societies; sustainable integration for returning migrants; migrants’ rights; and linkages between migration and development and trade. The report further highlights effective migrant management policies, and states that effective and human migration management policies benefiting migrants and society depend on broad international cooperation. Report. (GM Science Review Panel, July 2003) Requested by Margaret Beckett, the UK’s Secretary of State for the Environment, Food and Rural Affairs, and prepared by a panel of experts, this report contains the results of an independent review of current scientific knowledge on GM crops and foods. The report emphasizes that modern biotechnology is not a single homogeneous technology and that its applications need to be considered on a case-by-case basis. It also underscores the importance of regulation keeping pace with scientific developments. It identifies areas where more scientific research is needed, including allergenicity, soil ecology, farmland biodiversity and consequences of gene flow. A follow up report, to be published in the autumn, will consider further scientific developments, and comments from the public together with the results of the UK’s GM public debate. The deadline for comments on this first report is 15 October 2003. Report. (IUCN, 2003) The 2003 edition of IUCN’s ELP Newsletter focuses on implementation. It contains articles on the major themes embodied in the Johannesburg Plan of Implementation, reports on the meetings held during the “Law Week,” which preceded the World Summit on Sustainable Development, and information and updates on selected specialist groups of the IUCN Commission on Environmental Law. Newsletter. (IFPRI, June 2003) The International Food Policy Research Institute (IFPRI) and the Johns Hopkins University SAIS Center for Transatlantic Relations held a high-level consultation on food safety, food security and trade on 21 June 2003. Outcome. (IWA Publishing, May 2003) Edited by P. Lens, V. O’Flaherty, A.P. Moran, P. Stoodley, and T. Mahony, this book introduces readers to biofilms, which are important for beneficial technologies such as water and wastewater treatment and bioremediation of groundwater and soil, but which can also bring about problems such as bacterial infections, accelerated corrosion in industrial systems, oil souring and biofouling. The book presents the structure and function of biofilms as determined by recent research, and highlights their applications in medicine, industry and environmental biotechnology. More. (Springer Publishers, Berlin, 2003). Fifty authors from 22 countries contributed to this new book, Security and Environment in the Mediterranean - Conceptualizing Security and Environmental Conflict, offering readers a wide range of security and environment linkages from perspectives and disciplines of the natural and social sciences. The book has five chapters on water issues in the Mediterranean and Middle East, as well as two additional chapters that discuss the role of water scarcity, cooperation and conflict in the framework of the first three phases of a social science research on environmental security, and the role of water in a fourth research phase on Human and Environmental Security and Peace (HESP). More. (UNEP, 2003) To mark World Water Day and the International Year of Freshwater, UNEP has compiled a bibliography of more than 600 water publications from a wide range of UN bodies and specialized agencies. The bibliography is organized thematically by topics such as: drinking water; freshwater resources; water and sustainable development; water and health; marine resources; water treatment; water in agriculture; and water in urban areas. It also contains a directory of contacts for UN organizations involved with water, a list of water-related websites, various United Nations Resolutions on water, as well as selected UNEP Governing Council decisions concerning water issues. More. (IUCN, 2003) An updated and translated version of the IUCN publication “International Ocean Governance: Using International Law and Organizations to Manage Marine Resources Sustainably” by Lee A. Kimball is now available. This report evaluates the effectiveness of international agreements and organizations, and recommends numerous improvements. It includes a series of tables, which present a problem-oriented summary of global and regional legal instruments and an indication of the scientific, technical, and legal guidance offered by international bodies. It also includes a series of maps, which demonstrate the geographic relationships in eight ocean regions between regional marine and regional fisheries conventions, large marine ecosystems, major river basins, marine protected areas and national jurisdiction. Report. (Global Water Partnership, 2003) Recently published by the Global Water Partnership, this book, which brings together information on activities undertaken by local governments, civil society and the private sector and by those who facilitate local water management, is designed to spread these ideas on initiating local water resources planning, water saving, safeguarding local water quality, clean-up programmes, promoting transparency and turning organizations into water managers. The local actions documented in this volume provide readers with over 100 examples of what is being done in different parts of the world. This book follows on from ‘Ideas for Water Awareness Campaigns’, an earlier book prepared by the Global Water Partnership. More. (IWA Publishing, July 2003) Edited by P.A. Wilderer, J. Zhu, N. Schwarzenbeck, this book contains a compilation of articles on the current situation in China with respect to surface water quality and wastewater treatment. It provides results of specific research projects, and considers lessons learnt from experiences in other countries, particularly with respect to management and regulation practices. More. (Wetlands International, 2003) The report is organized under objectives, concepts and principles highlighted under Wetlands International’s Strategy 2002-2005 published in May 2002. Readers are provided with details, outputs and results of activities undertaken by Wetlands International in 2002, including programmes relating to: inventory, monitoring and assessment; wise use; and capacity building. Review. (IRC, 2003) Highlights of IRC’s annual report include a focus on the organization’s ability to provide improved access to and promote the use of knowledge in the water and sanitation sector and to build the knowledge sharing capacity of Resource Centers in the South. Report. (CERES, July 2003) Commissioned by CERES and written by Douglas Cogan of the Investor Responsibility Research Center, this report looks at how 20 of the world’s largest corporate emitters of greenhouse gases are factoring climate change into their business strategies and governance practices. A “Climate Change Governance Checklist” provides an analysis of the companies’ actions in the areas of board oversight, management accountability, executive compensation, emissions reporting and material risk disclosure. The report finds that many of these companies are not adequately disclosing the financial risks posed by climate change and also are not dealing with global warming issues in other key corporate governance areas. The report describes how investors can engage companies on climate change as part of the emerging corporate governance agenda, and includes recommendations for corporate boards/executives and policymakers. More. (Greenleaf Publishing, July 2003) Authored by Stephen O. Andersen and Durwood Zaelke, this book presents the “inventive genius” of ten global companies in achieving technological breakthroughs that help protect the climate and/or the ozone layer, while contributing to the companies’ bottom line. Companies featured in this book are Alcoa, Aviation Partners, DaimlerChrysler, Energy Star, Honda, Japan’s F-Center for Greenhouse Gas Alternatives, Seiko Epson, ST Microelectronics, Trane and Visteon. More. The Collaborative Partnership on Forestsï¿½ (CPF) electronic Sourcebook on Funding Sustainable Forest Management (SFM) helps users identify information on funding sources and the funding policies and delivery mechanisms of donor countries, international organizations, development banks, private sector entities and other relevant groups, in support of sustainable forest management in developing countries. Users are encouraged to make practical use of the knowledge contained in the Sourcebook and to enrich its content by contributing their knowledge and experience. The Sourcebook was developed by the CPF, an interagency partnership set up to support the UN Forum on Forests, with technical assistance from FAO and in collaboration with the National Forest Programme Facility. Published by GreenFacts, this study provides the current scientific consensus on climate change, structured in three levels of increasing detail. This resource is based on IPCC's Third Assessment Report. The European Commission's Directorate-General of Research has recently launched a website that provides an overview of endocrine disrupter research in Europe. The Ramsar Wetlands Data Gateway, developed in collaboration with Columbia University's Centre for International Earth Science Information Network (CIESIN), provides access to spatial and tabular data relevant to Wetlands of International Importance listed under the auspices of the Ramsar Convention on Wetlands. The Gateway enhances the accessibility and utility of data on Ramsar sites by facilitating online access, sophisticated queries and spatial data integration, and provides access to data on 1,198 Ramsar sites designated as of 30 August 2002. A new interactive set of maps and information links on the three international Site Networks for migratory waterbirds (shorebirds, cranes, ducks, geese and swans) in the East Asian-Australasian region has been established under the Asia-Pacific Migratory Waterbird Conservation Strategy. Wetland Link International (WLI), endorsed by the Ramsar Convention, is a global network of wetland education centers aimed at sharing ideas and expertise regarding wetlands. The United Nations Food and Agriculture Organization (FAO) has launched a new website aimed at promoting the use of telemetry technologies in fisheries and aquaculture management. Linkages is provided by the International Institute for Sustainable Development, publishers of the Earth Negotiations Bulletin. related to environment and development policy.